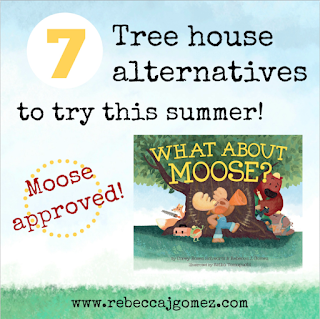 Rebecca J. Gomez: Book-Inspired Projects: Moose-approved treehouse alternatives! 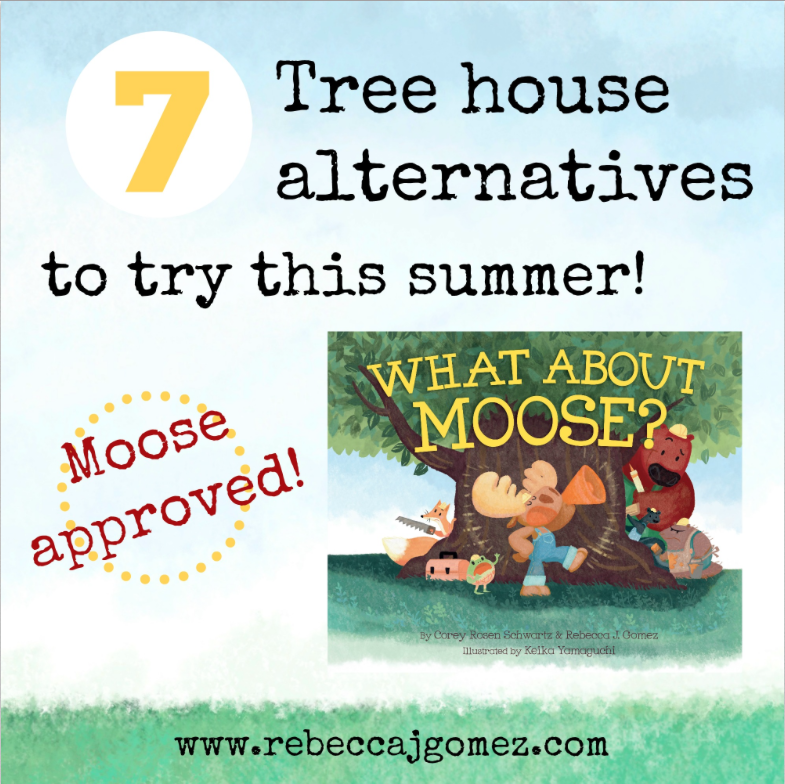 Book-Inspired Projects: Moose-approved treehouse alternatives! Reading WHAT ABOUT MOOSE? or some other tree house themed book may inspire your kids to build a tree house of their own. But what if building a tree house is not a possibility for you? No worries! There are plenty of alternatives that are almost as much fun! Build a fort out of blankets and pillows. The temporary nature of a blanket fort makes it ideal for a rainy summer day, or a day in which the temperature makes it impossible to play outside. Plus, building an indoor fort is not only fun, but it's an exercise in creativity and engineering. Just imagine the creative thinking involved in getting that blanket to stay in just the right spot! Pitch a tent in the back yard or family room. Blanket forts not your thing? Or maybe you're a little worried that the kids will pull that heavy lamp onto their heads? Pitch a tent instead! A small tent can be a perfect fort for indoors or out. This takes some time and commitment, but if you have the space, the time will be well worth it! 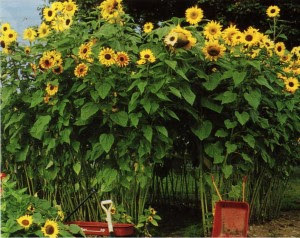 Imagine escaping into a hideout made entirely of sunflower stalks! That would be magical. Construct a mini tree house for a bird or fairy. You may not have the perfect tree house tree, but you can still build one for a bird or a tiny magical creature. Here is a good place to start for inspiration and instruction. Make a fort out of a large cardboard box. Empty cardboard boxes are full of potential, and if a box is large enough for a child to crawl into, then it will make a perfect fort for indoors or out. Decorate it to look like a house or a castle--like this one that I found at Cornerstone Confessions. The only limit is your (or your child's) imagination! 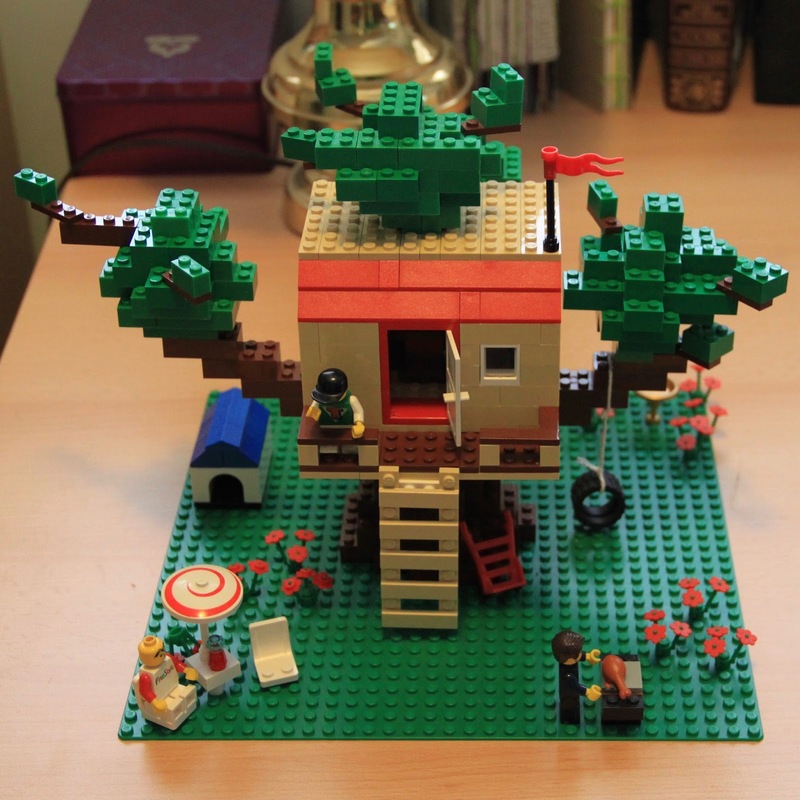 Build a tree house out of Legos. My kids and I have often stayed up late on summer nights constructing some ambitious structures out of these colorful blocks. Building a tree house out of the best toy ever invented can be a great way to spend a hot summer day! Design a tree house in Minecraft. A few years ago my son got me into the video game Minecraft. Not only is it a fun video game, but it's a great way to get creative without making a mess. A quick internet search for "minecraft treehouse" will give you an idea of just how creative these houses can be!